Welcome to Day 1 of the 12 Days of Holiday Inspiration Blog Event brought to you by "The Inspiration Crew". We’re just a group of online crafty friends who love being creative. 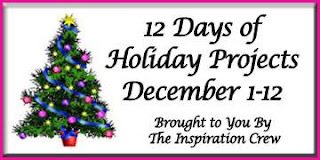 This time we're doing a 12-day event to provide you with tons of Holiday Inspiration. To kick off the month of December I'm sharing a very very simple Advent Calendar. My calendar last year was very time consuming, and while I loved it, I needed a little more simplicity this time around. All of the gorgeous rustic number squares were cut from a single sheet in the DCWV "Christmas Memories" stack. I matted each number on some DCWV holiday glitter paper and simply attached them to a gold ribbon with a clothespin. Done and done! Each day that passes, you take the coordinating number off the ribbon and pin it around the Christmas tree. I'll be linking up to the current Paper Issues gallery and the Advent Curtain Call. Thanks for joining me for Day 1 of our holiday event! Be sure to visit the other talented ladies to see what they have planned today! Very cute!! I love how decorative and easy it is. Love the tiny clothes pins! how totally fun.. i love it..
What a fun calendar; simple and pretty! I went rather overboard with one this year too...labours of love, indeed! Fabulous inspiration! Love how you added the gold and the clothespin! Fun Christmas project! how fun! 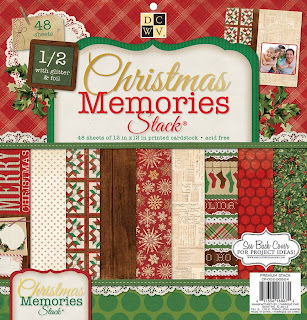 a perfect project for our Christmas Countdown challenge at the Curtain Call! So cute! I love the simplicity of it! Awesome idea! Love the colors and simplicity. What a creative idea...love that it is something that can be made easily without working on it for days and day! Great idea. This Advent calendar is great! So creative! I just love seeing what you come up with! Love it!! This is fabulous...looks like lots of work but so worth it, simply beautiful. I love Advent calendars but never thought I had enough time to make one - thanks for showing how it can be done quickly and easily and still be so pretty.